I have years of experience of running bridal shops and have seen hundreds of brides. There are the same common questions asked by brides and a few new ones that come up time and time again. I will set these out and give what I hope is the best advice for all brides and their bridesmaids, mothers, mothers-in-law2b, friends, Dads, daughters. What if nothing fits me? One of the most common questions asked by brides is what if nothing fits me. In a specialist plus size bridal shop the majority of dresses should fit up to size 36 off the peg. Dresses can also be made to measure for a small extra fee in certain designer ranges, such as Sonsie by Veromia. You should be confident that you will be able to try on a wide variety of styles and find your special dress. In a high street shop, there is likely to be a very small selection of plus size wedding dresses to try. Their main customer is not the plus size bride and the sample dress size is a 10/12. I have heard so many distressing stories from Brides about rubbish experiences in high street shops. Be confident in a specialist plus size bridal boutique such as Curvaceous Bridal of Sheffield. A good quality bridal shop will have a seamstress to whom they refer the bride. Sleeves and straps can be added to or taken away from any dress. This also applies to belts which can be removed, added or changed. Boleros are available in plus sizes. If the bride wants sleeves then it is worth stating that sometimes sleeves can draw unwanted attention to upper arms which is much better drawn to the body of the dress. The attention of admirers’ should be on the bride and not on her upper arms. Can I have a different colour from white? 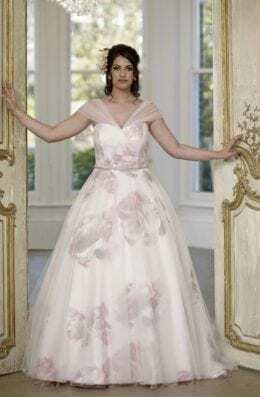 In Curvaceous Bridal of Sheffield, there are no white wedding dresses to try, this is because there is no call for white dresses these days and the majority of dresses are Ivory. Every designer has their own version of Ivory and can also be a dark Ivory or creamy ivory. Most wedding dresses are available in Champagne and there are also dresses in Victorian Rose, pale pink or blush. These colours are becoming very popular as they are so flattering to our complexions whereas white is harsh and very unflattering. One of the very important questions asked by brides is what about alterations? A good bridal boutique will have a seamstress to whom they can refer their brides to have alterations done on their wedding dress. It usually takes 3 appointments to have alterations completed or longer if the alterations are complicated. It is necessary to add a month to the delivery time of a dress to make sure that there is time for the alterations before the wedding. The cost of alterations are usually not included in the price of the dress and are agreed with the seamstress separately. Brides often worry that the beautiful back of their dress will not be seen through the veil. A good veil is transparent and made of silk, edging on a veil can match or complement the wedding dress. 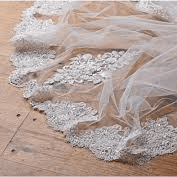 For example, a lace-edged veil can match the lace appliques on the wedding dress. The practice of putting the first tier of a 2 or 3 tier veil over your face when walking up the aisle is also fading with time but some brides still want to do this when being ‘given away’ by their Dads. A 2 or 3 tier veil does add volume to the veil and can be very flattering. Most veils are shorter than chapel or Cathedral as they are easier to handle and lighter to manage, but there is no beating a full-length veil framing the brides wedding dress for an impact when walking down the aisle. I hope you have found this blog helpful in answering the most common questions asked by brides. Make sure you enjoy trying on wedding dresses and choose your beautiful wedding dress for your special day.